Could you please inform us about the context and background of INSEC’s establishment? INSEC was established as per the need of the then time. Both Prakash Kaphle and I, who were the founders of INSEC, were also the founders of MASAM. Besides, we had founded another organization named Prajatantrik Rastriya Ekata Manch. One was meant for advancing human rights movement in the country and the other was for the political movement. Various friends were involved in those organizations. Badri Khatiwada, I and Prakash Kaphle were involved in both the organizations. MASAM had been demanding especially for the release of the prisoners of conscience at that time. The broader political direction at that time was to end the then Panchayati autocratic rule and restore multi-party democratic polity. And, within the political direction, we were ideologically affiliated to the then CPN(ML), which was doing its activities in an underground way. It was necessary to encompass all the political parties other than Panchayati supporters for the purpose of comprehensive unity among the parties and also for consolidating people’s movement. Those parallel organizations having their own objectives and distinct identities were formed. As heavy preparations were underway for the People’s Movement 1990, we were in need of disseminating information nationally and internationally on how human rights violations were taking place in the country. Therefore, it was necessary to go for political struggle by combining both – politics and human rights. Accordingly, our friends from different political parties, especially those who were affiliated to left parties and were in need of camouflage of various social forums to continue their political mission wanted to be the members of MASAM. Political rights started to be discussed. However, it was quite necessary at that time to be clear about our kind of human rights definition and to know the situation of human rights in other sectors of Nepali society such as jail, disappearances etc. Opposing the Panchayati rule and monarch was to be charged with high treason at that time. Criticizing the monarch was like committing public offence. Hence, those who were imprisoned under these offences were said to have been imprisoned under criminal case. Challenges were there before to debunk this and prove those cases to have been political, not criminal. It was required at that time to establish the fact that criticizing the king was not a crime and opposing the autocratic Panchayati regime was right of people. We were also required to manage and document these issues. Our international friends had suggested us that it would be prudent to provide information to the international community through the legitimate institution of the time. Accordingly, we, Prakash Kaphle and I, among other confidants, discussed the need of forming a legitimate organization. The international community was not aware of our situation that forming and registering organizations was prohibited in Nepal. With the aim to disseminate the human rights situation of the country internationally, we registered an organization, disguised as a research team, titled “Informal Sector Research Center”. It was not possible to register social organization at the District Administration office. Hence, the center was registered at the Department of Cottage and Small Industries as an organization to carry out studies on various social issues. A cart pusher is seen pushing his cart in the INSEC logo. Does the logo have any thing to do with INSEC works? 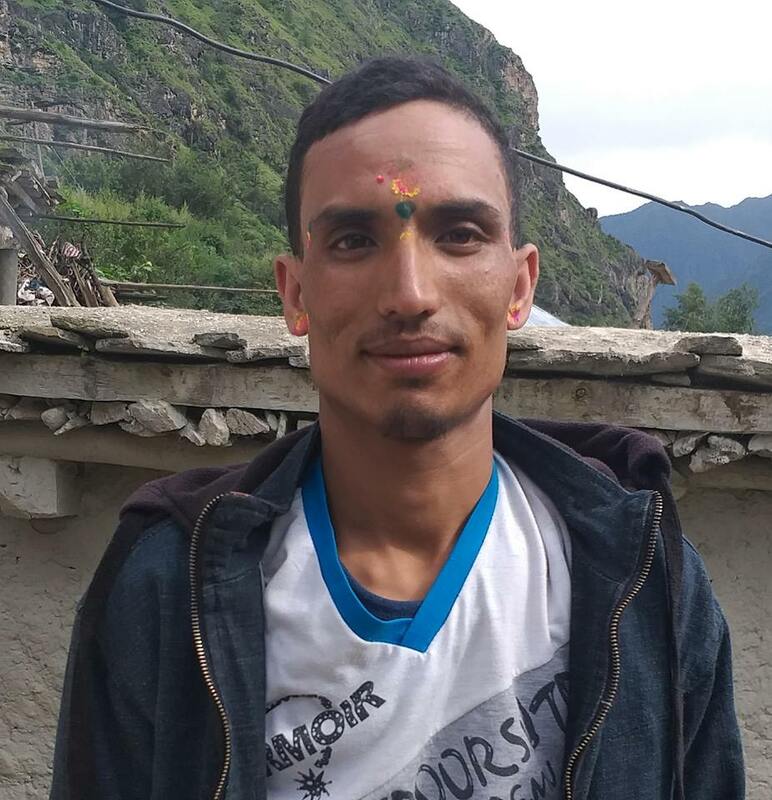 Although the organization had an ulterior motive of documenting human rights situation of the country, it started to conduct studies on health and education situation of porters especially of the cart pushers of the Kathmandu valley. Therefore, we can still see an image of pushcart as the logo of INSEC. The logo was designed by Bishnu Rimal, the current President of GEFONT. Seemingly, it was a social organization, but the organization was supposed to record the incidents of human rights violation and the abuses and disappearances committed by the autocratic Panchayati regime. We used to provide information to the UN and other concerned international organizations as per need. How challenging was it to work for human rights at that time? I cannot imagine even now how difficult the situation was at that time. The generations brought up after the liberal democratic set up especially following the political movement in 1990 and living in the republican era cannot imagine the difficulty. Those who lived some 20 years ago and experienced the regime can explain the then situation, which is necessary to know by the present generation. Literally, we had to conceal our computers, physical assets and documents. The friends from the Netherlands Development Organization had helped us at that time. We did not need to bid/submit proposals at that time for monetary support. Some organizations would provide with computers, fax machines and some others would provide donations. How did INSEC focus its work only on human rights later on? Following the success of People’s Movement in 1990, it was realized that the organization had to be changed into a non-government organization. Accordingly, it was registered at the Kathmandu District Administration Office by slightly changing its name – Informal Sector Service Center. The word “research” was replaced with “service”. The organization was established with the help of Badri Khatiwada, Birendra Keshari Pokhrel, Subodh Pyakurel, Santosh Pyakurel, Prakash Kaphle, among others. Now, we had an objective of turning the organization into an institutional one. We had thought of developing INSEC as a human rights organization having its network across the country. Once I was appointed as a member of the NHRC, the then General Secretary of INSEC Dr. Shiva Sharma was made its officiating chairperson. Before this, Dr Rajesh Gautam was the General Secretary. He has been actively involving on human rights issues and contributing to INSEC. The executive committee of INSEC was and is broader. Many institutions and organizations came into existence following the political change of 1990. However, INSEC worked with the aim to take the human rights issues down to every village. The then General Secretary Late Prakash Kaphle used to reiterate that human rights movement would not succeed if it is not taken to every village and household. Later, he died in an aircraft crash July 31, 1992. We formed human rights groups in 25 districts in the first phase and had them registered in their districts. Similarly, we provided support to the organizations besides providing affiliation with INSEC. Could you please say something about the initial work experience of INSEC on human rights? By the time it was 1991, politics started to be gradually criminalized. It was an issue before us waiting for intervention. We had published informative and awareness-raising posters targeting the general election of 1991. The posters had intended to provide knowledge on the types of candidate running for election and also on which category of candidates to vote for. Prakash Kaphle had also taken lead on the observation of election. He was the general secretary of the election observation committee formed at that time. After working on various issues, INSEC thought of working on economic, social and cultural field in collaboration with others in order to uncover the issues in the field. We had heard of the prevalence of Kamaiya system (bonded labor) in the areas such as Banke and Bardiya. Prakash Kaphle and I reached there in 1992 being informed that they are even sold and bought. We stayed there for 15 days studying the local society and villages. Later on, we conducted an intensive survey in three districts on their problems and then published a report. This made it public for the first time that Kamaiya was a practice involving bonded labors. Anti-Slavery International proceeded with the issue. Jointly with the organization, we conducted another study on the topic later. Then other organizations too started to work on it. We, now, started to work for the liberation of the Kamaiyas. In this way, INSEC moved ahead on the socio-economic and cultural issues as well. We also started to publish human rights year book believing that it was necessary to document the rights situation in the country and data covering a period of a year on the issue should be made available. The very book has been established not only in South Asia but also internationally as a book on human rights documentation. Generally, we don’t find any yearbook containing the incidents, data and facts on human rights situation. The yearbook was started to be published since 1992. INSEC has given continuity to its publication. As a pioneer human rights activist of Nepal, how would you campare the human rights movement now and then? The organization intends to expose the hidden issues with the help of other organizations rather than competing with them. There were very few human rights organizations in Nepal by the latter half of the 1980s. MASAM, NEMADHISANGH and INSEC were the organizations. We had helped in establishing at least one human rights organization in each district. Now, the situation is different. There are several organizations in every district now. Thousands of human rights activists are working there. However, so many issues related with human rights are remaining unaddressed primarily because human rights issues have resembled projects. We have been motivated by the misconception that we must receive foreign assistance to work for human rights whereas human rights is a movement of commitment, which goes on continuously. The issues on human rights keep on increasing over time relatively. The outlooks on the issues too get matured accordingly. The more a man becomes free, the more issues they raise on human rights. Therefore, human rights movement is a movement of commitment. Our country has been engulfed by impunity, and politics has been criminalized. Our society is on the verge of division. The issues such as how to consolidate integrity among people and how to make people committed to peace stands as a challenge before us. Violence has been adopted as a sole means for political change and also for having ones’ own demands fulfilled. This is trending over time. The Maoists moved ahead based on weapons and established themselves as the largest party later on. Other parties are also becoming the Maoists’ imitator now. This tendency has made the country divided by community and regionalism. So much so that divisions by ethnic line and religions are being appeared. This is a big challenge for human rights movement. Overcoming this challenge is a challenge of human rights activists. Being born as the first generation human rights organization, INSEC raised particular human rights issues and took them to certain resolution. The human rights issues are on the rise now. Similarly, the issues of the past are also remaining unresolved. Keeping this scenario in mind, we have to move ahead for the integrated human rights movement now. We are no longer small and helpless. Similarly, little knowledge is no longer a problem now. Many exponents on a par with international standards are already with us in Nepal. The national mechanism on human rights such as the NHRC is already formed. National Women Commission and Commission on the Dalits are already in place. However, the human rights movement in the country is divided. INSEC was visible nationally and internationally during armed conflict due to its role on minimizing the effects of conflict on people and saving their lives? What role did it play in this connection? Human rights organizations were formed all over the country being affiliated to INSEC since 1991. So far as the role of INSEC during armed conflict is concerned, INSEC and the other organizations working in partnership with it in the districts such as Rukum, Rolpa, and Jajarkot were working actively for the cause of human rights. The organizations had played role in freeing people from their abducted situation and had prevented the ongoing violence from turning into an inhumane one. INSEC played role in preventing conflict in the districts. People started to be killed when police intervened and started repression against the “Seize Campaign” of the Maoists in the Rolpa district. INSEC revealed the situation of the region through Prachi and urged the state mechanism to remain more restrained. On the one hand, it urged the state to act as per the democratic norms of the multi-party system and, on the other hand, it exerted pressure on the Maoists to remain within the boundary of the international humanitarian laws. Despite INSEC’s efforts, a big violence occurred. However, the situation would be more violent if INSEC and other human rights activists were not present in the conflict affected regions. INSEC helped in releasing many people abducted or arrested by the Maoists as well as the security forces. Similarly, many were saved from being killed of subjected to enforced disappearances. INSEC had been playing leading role on forming national mechanism on human rights. Therefore, I succeeded to become a member of the NHRC while working as the Chairperson of INSEC. Violence was going on in the country at that time. The presence of state in the conflict affected zones was very weak. So, we had been demanding for an independent national body that could autonomously look into the incidents of violations. The state was committing more violations at that time. The Maoists too were committing violation and abuses. We were put into custody many times only by dint of the fact that we had been demanding for an independent body on human rights in order to make both the warring sides responsible. Our movement was so efficacious that the NHRC was established finally. Some people comment that INSEC is tilted toward a particular party. What would you say to those who comment in this way? INSEC is perceived as an organization close to the CPN (UML). As the organization was not picked up from somewhere, I don’t take this as a big deal. Democracy was established before human rights organizations/movements started in South Asia or in the world. The organizations such as PUDR and PUCL in India were born after Indira Gandhi imposed emergency in the country. The human rights organizations under democracy, of course, represent from apolitical sectors. However, the human rights movement in Nepal is moving ahead being embedded with restoration of multi-party democracy following the end autocratic Panchayati regime. and establishment of multi-party democracy. So, those who are involved for human rights movement are also the individuals having political consciousness. Therefore, they are also affiliated to politics. The personalities such as Rishikesh Shah, Tulsiman Amatya, Narayan Man Bijukchhe, Dr. Baburam Bhattarai, among others, were affiliated to Nepal Manabadhikar Sangathan. Those who were affiliated to MASAM and NEMADHISANGH had raised voice for human rights. Most of the figures affiliated to MASAM were from political parties. Similarly, when INSEC was established after MASAM, the leadership of the former was affiliated to the then CPN (ML). What is important in this connection is that political prejudice should not be reflected on the human rights issues. Accusations were there even while I was leading the INSEC. As it always worked on human rights issues remaining above party politics, the accusations could not be effective. As some persons from the organization are affiliated to the CPN (UML) one way or another, people come up with political accusations. Whenever the issues and incidents published in the Human Rights Yearbook has to be challenged or refuted, such the allegations are put forth. However, the Yearbooks are found in many libraries and human rights organizations as a reference material to understand the situation of human rights in Nepal. This is because the book is free from petty interests and political prejudices. Almost all types of libraries and human rights organizations have kept Nepal Human Rights Yearbook as a reference material. If it was not credible, people certainly would not use this. Impartiality and balance is most important in any work that we involve in. We have to see whether the work has been completed being politically biased or as per the objective of the organization. People do have their subjective views. Every individual is endowed with rights to put forth their views. Those who have embraced the Maoist ideology have also founded human rights organizations. The persons affiliated to the Nepali Congress are affiliated to such the organizations. Rastriya Prajatantra party related people too might have affiliation to human rights organizations. Therefore, political blames do not keep meaning. As human beings are political by nature, possessing the ideological tilt is a subjective matter. So, how organizations work is more important. Organizations should not possess the ideological tilt and also should not involve for the propagation of ideology. Therefore, trivial issues should not be and are not the problem for INSEC. It should not take the accusations as a big deal. INSEC has completed its 20 years working on human rights and social justice of Nepali society. What is your view on the financial sustainability and the working modality required to be adopted by INSEC in particular and other human rights organizations in general in Nepal now? There requires economic and financial source and this applies in the case of human rights organizations too. The economic condition of Europe is getting a bit weaker over time. The European donor agencies have been monetarily contributing especially to human rights organizations in Nepal so far. On the one hand, the European countries’ internal economic condition is weakening and they have been attracted towards Arabian countries on the other. Their priority is also shifting with the belief that the Nepalis can control their situation by themselves. Similarly, the economic progress of India and China has also affected Nepal. However, people’s economic, social and cultural rights are going to be further shrunk due to liberalization and globalization. In this context, Nepal will have to address these problems through human rights perspectives and it is also likely that human rights organizations will face problems relating to their sustenance. The human rights organizations in Nepal, now, have to move ahead towards integrating all the human rights issues. Similarly, it should move ahead on the basis of a system in which less number of personnel will accomplish more work. Now, we have to attempt toward creating a situation in which even the big business families and corporate sectors will contribute to human rights movement. We generally spend time by writing proposals, submitting them to the donor agencies and also by holding meetings. We are a bit backward on attracting big business families and industrialists to the human rights issues. So, it is necessary for the leading personalities of the human rights movement to dwell into this issue. Similarly, the NGOs working in the field of human rights have to work together to institutionalize the human rights movement rather than working separately. The issues of human rights should be discussed in the academic institutions, universities, campuses, trade unions and teachers’ organizations. They have to be made aware of human rights issues and encouraged to partake in human rights movement. Therefore, the tradition of deploying personnel at the village level and spreading awareness with the help of pamphlets and posters should be gradually minimized. The aforesaid groups should be urged to spread human rights education and awareness while working at the village level.